Last week I detailed a current incident that shows why PS&E should not be considered a viable candidate as the law firm employing our law director. Some people think that only the individual who was the law director was responsible and the firm should not be held responsible. They make this argument even though in the next breath they talk about all the knowledge and support the rest of the firm gave the previous law director during his time as our law director. Then they count this advice as a positive that we can look forward to in the future. It is a shame we only received two bids for our law director position but the reason behind this falls on a negative reputation this company helped to promote. Given PS&E’s poor performance these past five years and we have a better choice, re-hiring PS&E would again signal to the rest of the area it is business as always in the City of Huber Heights. Remember PS&E was the law firm that supported our law director when the Aquatic Center was conceived and built. If you recall, in the meeting it was revealed to the public, the public was introduced to the “future”; architect, construction manager, operations manager and location. Also in that meeting one of the Council members noted that there had been many, many meetings and many, many hours of discussion by council about these details, all in executive session. Open meeting laws and the standard bidding and award processes are designed to help protect the public. We did not get either because the lawyers at PS&E helped devise a way around these protections. As a result, we as a city spent $10 million dollars building a $6 million dollar facility. PS&E was the firm providing support when we signed an agreement with Good Sports for the purchase of property. This led to the city spending $350,000 making a shovel ready lot for a specific facility. This construction may or may not be useful to the eventual company that purchases the property. PS&E was the firm providing support that drew up the contract for the construction manager contracts for the Music Center and the Fire Station. If you recall, we did not go to bid when we hired a specific llc to manage the construction of both the Music Center and Fire Station. One of the reasons given for not going to bid was because it is not common practice to insert an additional construction manager between the City employee that acts as the construction manager and the employee of the construction company that is their construction manager. Huber Heights had pretty much invented this method of construction management and there were not any other companies to give us bids. Even though this llc collected nearly $1 million dollars from the city, and the owner of the llc has a close friendship with a council member, PS&E did not support requests to get the owner to sign a conflict of interest agreement with the city. When awarding a contract for construction the city has adopted a system which they characterize as “value engineering”. In this process the construction manager opens and reads the proposals. A firm is picked and then the construction manager approaches that firm with the materials and processes he liked from the other proposals. He then has the chosen company use those ideas to lower the cost of their proposal. The other companies are not given the same opportunity to lower their estimates. This practice is known and not objected to by PS&E. PS&E was the supporting firm that helped draft the agreement that was supposed to bring us “The Heights”. Neither party has fulfilled any of the duties within that agreement. I’ve heard recently that the advice was to assume that the agreement expired. The appropriate way forward would be to get a formal declaration from both parties of our current understanding of the status of the agreement. I am going to close by stating something everybody knows but also something I have tried to fix these past few years without coming right out and saying it. 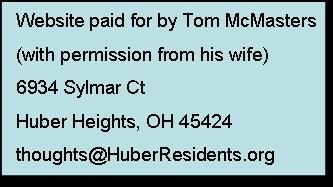 Whether deserved or not, Huber Heights government has a long reputation of shady dealings. I heard these rumors before getting elected. Right after being elected I heard from many residents, company officials, organizations and surrounding government officials with a similar theme. My solution for changing that reputation has been to promote transparency through all of our processes. Replacing the previous reputation with one where people are confident processes are fair and open has been the factor driving my campaign for transparency. This is why I have spent so much time on the Energy Aggregation issue. It is also why you will see future articles explaining again why my actions in Energy Aggregation need to be examined and documented as the model going forward. It could just be unfortunate miscues that made it so 8 pages of a bid proposal were missing, bad calculations were made to the detriment of the same bidder and then false assertions about that bidder’s cancellation fees were presented as facts. But left uncorrected these incidents would take us back to those days when everyone questioned the motives of city officials. We have to have a system in place that allows us to make those corrections so all bidders know they will be treated fairly and equally. We have to have a system where all residents know their government officials are above board. We will not shake that old reputation as long as we have a law firm that endorses stretching the limits of going into executive session to the breaking point. 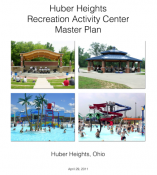 In years past, they endorsed fully developing the Aquatic and Music Center proposals in executive session because land had to be purchased in order to build these projects. The result is a four lane lap pool and millions of extra dollars in cost. Even now they validate questionable reasons for council going into executive sessions. To fulfill the goal of promoting a reputation throughout the area that leads more companies to believe they have a real chance of doing business with the city, we need to separate ourselves from those entities that prompted the previous reputation. If we do this, we will in turn see more firms and individuals constructing bids for our positions and projects. PS&E is one of those entities. It is a shame we only received two bids for our law director position. Given PS&E’s poor performance these past five years and we have a better choice, re-hiring PS&E would again signal to the rest of the area it is business as always in the City of Huber Heights.